Whether the presidential race just got a lot more entertaining or frightening is the question. In true “the enemy of my enemy is my friend” fashion, New Jersey Gov. Chris Christie endorsed New York billionaire Donald Trump in the race to be the Republican nominee, and Florida Sen. Marco Rubio must be sweating more than is his wont. The Jersey tough guy who gave Rubio such a hard time in that infamous GOP debate, throwing him off his stride before the New Hampshire primary, is joining forces with the front-runner Rubio grilled in this week’s debate face-off. In fact, Rubio mocked Trump with the charge Christie leveled at him — the repetition of talking points — though without the same devastating effect. But right now it’s two against one. On the one hand, this is serious business, this choosing of the man or woman who would lead America. If it’s serious policy you’re looking for on immigration, taxes and national security, it’s already hard find it in GOP debates that inevitably descend into squabbling, carefully rehearsed punch lines and reams of opposition research cut down to occasionally manageable size. With the insults that are sure to fly, good luck on that score from now through primary season. On the other hand, grab the popcorn and watch. The only thing that would make this new partnership more riveting is if the broheims joined together on the Republican ticket, with Trump at the top and Christie as his henchman, excuse me, running mate. The egos might get in the way but a few beers and some arm-wrestling should settle things. Remember back in 1992 when conventional wisdom said Bill Clinton and Al Gore together on the Democratic slate was too much — too Southern, too baby boomer, too “their wives look too much alike” thing? But the youthful pair and their respective partners fit the change-ready mood of a country. And it worked. In 2016, what better team to represent the inchoate, loud, often confrontational anger gripping the country, evident at crowded Trump rallies across the country than a ticket just bristling with it? Pity the poor heckler to confront a joint appearance by these two: What would Trump do to a protester at a Nevada rally? His answer: "I&apos;d like to punch him in the face." He also has said he could shoot someone in the middle of 5th Avenue and not lose voters. Christie, for his part, once told a post Superstorm Sandy heckler to "sit down and shut up." The governor, whose own hopes for the presidency died in New Hampshire, once decried the entertainment aspect of this year’s race and touted his own experience running a state. At the endorsement announcement, though, he mostly stuck to his admiration for the leadership skills of the businessman, real estate mogul and reality-show star, and Trump’s ability to take on the Democratic front-runner Hillary Clinton. It was mutual admiration at the Fort Worth, Texas, appearance, with Trump saying the two had been friends for years before throwing some insults Rubio’s way. Right now, though, Rubio is the target. The Trump-Christie announcement stole the Friday spotlight from his “tough Marco” tour, feeling his oats as he basks in good reviews for his Thursday night debate hectoring of front-runner Trump. Was that performance too little too late as Trump leads in most Super Tuesday polls, and even in the upcoming primary in Rubio’s own Florida? When Christie stumps for Trump, will voters be attracted or will it be too much of a brash thing? Will Trump and Christie succeed in bullying Republicans, Democratic hopefuls and the rest of America into submission? Trump demurred when asked if Christie could be his running mate, but he didn’t rule it out. "He&apos;s certainly got the talent,” he said of Christie. And he’s ready to take that talent on the road. 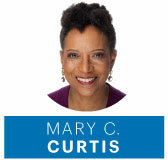 Contact Curtis at marycurtis@cqrollcall.com and follow her on Twitter @mcurtisnc3 . Mother-Child Relationships Are Complicated. Ask Jeb Bush.